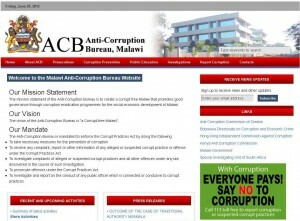 “Nyasa Times” reported the arrest of Malawi’s Anti Corruption Bureau (ACB) director Alexius Nampota. Fiscal police units arrested him on Thursday in Blantyre accusing him of abuse of office charges. The story started already in 2011 when Nampota was supposed to attend a two-week Leadership Course at the Royal Institute for Public Administration (RIPA) in the United Kingdom. Because of the diplomatic tensions between late Mutharika’s administration and the British government, a foreign travel ban for governmental officials was actually preventing Nampota from flying to the UK. Instead, the validity of his ticket was extended and with the forex he got from the ACB, he flew to Dubai with his wife. These actions now resulted in the arrest of Nampota. Interestingly, there were recently differences between the Office of the President and Cabinet (OPC) and Nampota concerning the termination of his contract. I was told to quit and get my benefits for the remainder of my one year and half and I told them fine have my money ready… I cannot exactly say that it’s an arrest but rather I’m only being victimised because I’m handling very big cases involving top government officials hence these frivolous charges to silence me. It remains to be seen which side of the coin will actually be the true one. So far it’s one person’s word against another’s. However, if the charges become true and the ACB’s director is convicted in office, this would be both quite a scandal and an important blow against corruption in Malawi’s public sector.